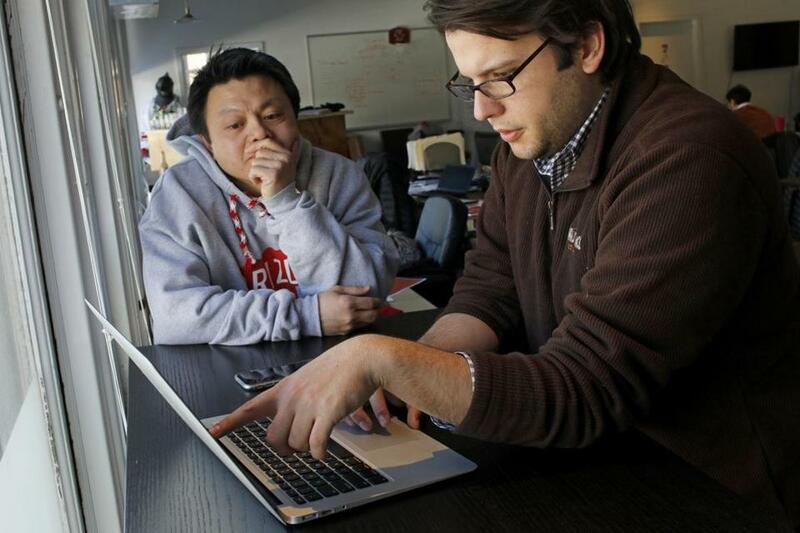 Nick Rellas, co-founder of Drizly, talked with Phuc Truong, senior vice president of ad sales. For years, Massachusetts tech executives have been complaining about how hard it is to fill job openings — that whether they’re looking for a few or 50, there just aren’t enough qualified candidates for companies to grow at the pace they want. So imagine if one tech company came in and tried to hire 50,000 people. That’s the potential if Amazon selects Boston for its second headquarters. Overnight, just about every company with a tech focus or IT department would find itself in head-to-head competition with one of the biggest draws in the business. “Amazon coming to Massachusetts would intensify the war for talent to levels we’ve never seen,” predicted Gary Beach, editor emeritus at CIO magazine and a board member of the Massachusetts High Technology Council. There are some in the tech community who argue that Amazon would actually help solve Boston’s longstanding labor problems, by establishing it as an indisputable tech mecca and eliminating any vestiges of its reputation as the city that Mark Zuckerberg rejected for Silicon Valley. 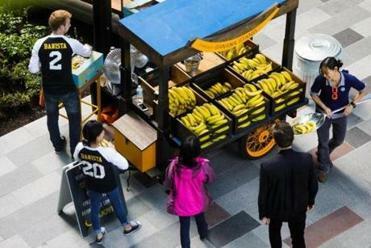 If Boston gets next Amazon HQ, will it get free bananas too? The ripe idea hasn’t always been a bunch of fun for fruitsellers. But Nicholas Rellas, chief executive of alcohol-delivery startup Drizly, doesn’t buy that line. Having Amazon here, some tech executives argue, would make Boston a magnet for qualified workers from elsewhere in the United States and beyond. Moreover, Amazon might reverse the “brain drain” of college graduates leaving Boston for other regions, notably Silicon Valley, where some perceive their career prospects to be stronger. An analysis by the real estate services firm CBRE found that Boston, among 40 regions studied, had the largest gap between the number of technology-related degrees awarded by local schools and the number of new tech jobs created by the local economy; between 2011 and 2015, colleges in the Boston area awarded 31,400 technology-related degrees, while the region created only 11,790 jobs. Others hope Amazon would prove to be the catalyst to finally bring a huge untapped reservoir of potential workers into the high-paying tech economy: minorities and urban residents who have largely not participated in this jobs boom. The Mass Technology Leadership Council last year found that only 3 percent of computer workers in Massachusetts are black and 5 percent are Hispanic. David Delmar, executive director of the nonprofit training program Resilient Coders, said that in coming to Boston, Amazon would have to be heavily involved in school and training programs, including nontraditional ones such as the boot camps his organization runs for young people from underserved communities. In its proposal for a second headquarters, Amazon asks communities if they have partnerships and potential for “creative programs” with local employers and schools to increase the tech labor pool and seeks details on computer science curriculums in elementary and high schools. While the 50,000 hiring target is huge, Amazon expects to take 10 to 15 years to get to that point. By comparison, Massachusetts added 52,100 new jobs in all sectors in 2016 and has averaged 28,500 a year over the last decade, which includes the recession of 2008-09. As part of its conditions, Amazon links the availability of talent with their ability to commute to work. The company asked communities to describe the condition of their highway and transit networks and pointedly requested the “ranking of traffic congestion for your community and/or region during peak commuting times. Robert A. Nakosteen, a University of Massachusetts Amherst professor who studies demographics and labor markets, poses this question: Even if Amazon could find enough hires, where would they live and how would they get to work? “I don’t get it,” he said. “I just have real doubts they could ever fill that many openings,” because of the strain on the housing markets and transportation systems. Massachusetts, largely by virtue of its educational system, typically ranks highly for its development of tech talent. Research by the Mass. High Technology Council shows the state has the highest per capita concentrations of science, technology, engineering, and math degrees and also has the highest percentage of workers who hold bachelor’s degrees. But even those factors have not been enough to slake the demand of local employers. The high tech council, a trade group based in Waltham, recently ranked Massachusetts as among the hardest places in the nation to hire tech workers. Tech leaders have turned that into a political issue, citing their own hiring experiences to push for programs that expand the work force, including full-throated support for visa programs that bring in tech workers from overseas. Still, some tech leaders in Boston say Amazon’s time frame is long enough to allow them to work with public and education officials on expanding training and take other steps to increase the labor pool. Katie Burke, chief people officer at HubSpot, said the Amazon competition should be the catalyst for local business and political leaders to boost the tech labor pool for long-term growth, whether the company ends up choosing Boston for its second headquarters or not.